Venting membranes for water as well as nearly any solvent! Novamem venting membranes are perfectly suitable for a wide range of liquids. Membrane venting is similar to membrane distillation and pervaporation. The membrane is non-permeable for the liquid phase of the solution but permeable for the gas phase. This is achieved by repellent porous polymer membranes. For example, a hydrophobic PVDF membrane repels water so strongly that it will not flow through the pores of the membrane voluntarily. Smaller membrane pores increase the resistance against a repelled liquid, since the surface is between liquid and membrane is strongly increased in relation to the volume. As Novamem produces membranes with smaller than usual pore sizes, the pressure to overcome the repellance is much higher. Consequently, the membranes of Novamem can be used even with liquids under pressure. 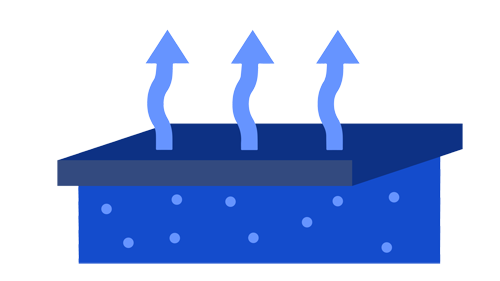 This increased liquid resistance is especially important when dealing with mixtures or solutions with significantly less surface tension than water. The repellance of such liquids is much lower and has to be promoted actively by lower pore sizes. Our venting membranes for any application!